…because men deserve cleaner, safer skincare, too. Whether a man uses a bar of soap for everything, or sneakily steals his wife’s lotions and potions… there’s a reason that men need their own skincare regimen designed specifically for their skin. The truth is that men’s skin is biologically different than women’s skin. Did you know? Once a man hits 50, the signs of aging are immediate and advance at a more rapid pace! 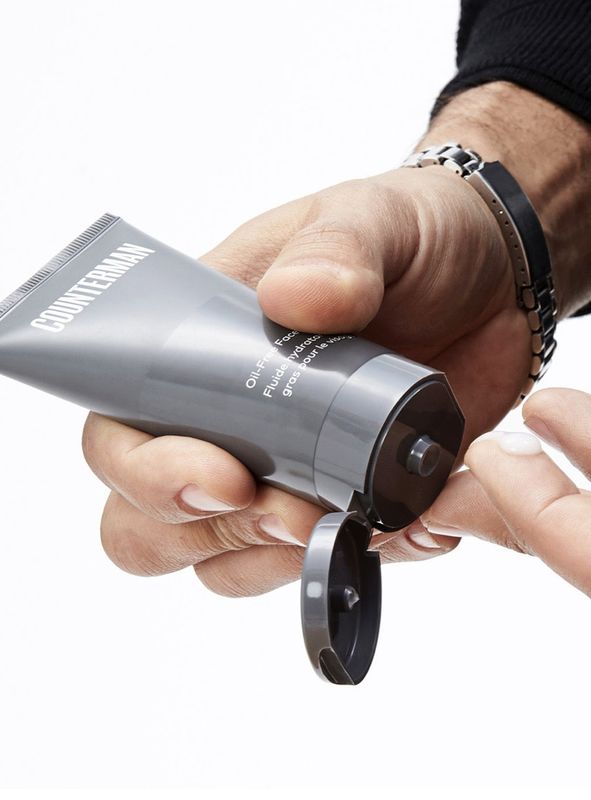 Introducing COUNTERMAN, a results-driven, clean, safe, simple skincare designed specifically for men’s needs. Everything a clean shaven or bearded man needs…and nothing he doesn’t. IT’S ALL FUNCTION, NO FUSS. * Purchase a 4-Step Regimen and receive a 10% discount and a FREE GIFT of one of our best-sellers! * The Shave Regimen Bundle includes all of the products listed above except for the Cooling Aftershave Tonic, which must be purchased separately and is recommended. 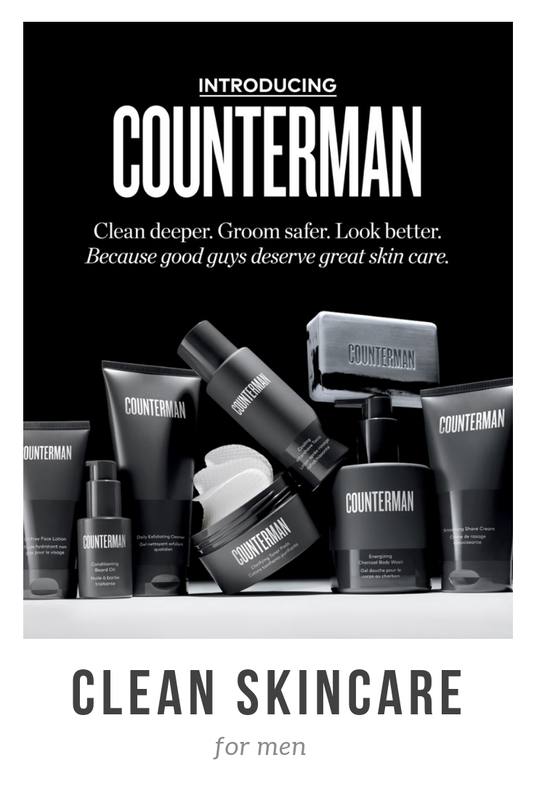 My husband has been using Counterman and LOVES this skincare line. He was one who used a bar of soap and body lotion on his face previously. The first day I had him try the Exfoliating Cleanser before he shaved with the Shaving Cream…he called me from work mid-day to tell me he’d never had a closer shave in his entire life and said his skin felt so soft. I never thought I could get him to try the Toner Pads….and he’s loving this step! He absolutely loves the scent of these products too…and he’s someone who loathed cologne. …and ladies, I cannot even tell you how much I’m obsessed with the smell of these products. Seriously. You want your man wearing this stuff. Nix the overpowering cologne and hand them Counterman instead. HOW ARE COUNTERMAN PRODUCTS UNIQUE? Featuring high-tech Sequoia Stem Cell Complex, all Counterman formulas help protect skin from everyday stress, while providing safer and cleaner products dedicated specifically for men. WHAT IS THE SEQUOIA STEM CELL COMPLEX AND WHAT ARE THE BENEFITS? Plant stem cells have the properties and the ability to self renew. Also, plant stem cells never undergo an aging process but instead perpetually divide to produce new cells. Plant stem cell technology helps to increase the availability of these extracts and allows us to have consistency in our formula. In general, men have oilier skin than women and may prefer an oil-free moisturizer. Therefore, no essential oils were added to fragrance the product. For balanced, healthy-looking skin, apply Oil-Free Face Lotion day and night. WHAT IS THE RIGHT WAY TO USE THE COOLING AFTERSHAVE TONIC? WHY IS THE SMOOTHING SHAVE CREAM FRAGRANCE-FREE? WHAT SCENTS ARE IN THE COUNTERMAN PRODUCTS? At Beautycounter, we handpick every ingredient that goes into our products using our industry-leading screening and testing procedures. We apply this same rigorous selection process to every fragrance additive, including essential oils. That means our skin care and cosmetics, including Counterman, are scented with natural ingredients instead of synthetic fragrances with unknown components. Our Oil-Free Face Lotion and Smoothing Shave Cream are fragrance-free. Did you know: Inspired by the Sequoia tree, many Counterman products feature a fresh, woodsy fragrance comprised of vetiver’s earthy notes and bergamot’s citrus spicy-floral scent. WHAT ARE SOME POSSIBLE SKIN ISSUES ASSOCIATED WITH SHAVING AND HOW DO YOU MINIMIZE THEM? Shaving can stress and irritate the skin since it’s a form of physical exfoliation. In order to help minimize possible skin discomfort associated with shaving, follow the Counterman Skin Care Regimen and use Counterman Smoothing Shave Cream, then follow with Counterman Cooling Aftershave Tonic. Before you shave, prep your skin. Use Daily Exfoliating Cleanser to remove dirt and help exfoliate dead skin cells.Expert tip: You’ll get the closest shave right after a shower. Steam helps to open the pores and soften skin. First, make sure to shake the bottle well before applying Smoothing Shave Cream. With a clean, sharp razor, begin shaving in the direction of hair growth, and then go back over the area in the opposite direction for a closer shave. Post-shave care is just as important. Splash your face with cold water to help visibly tighten your pores and remove any residue. Pat skin dry, then follow up with Cooling Aftershave Tonic to calm post-shave discomfort and refresh the skin. Always remember to follow up with a moisturizer, Oil-Free Face Lotion, to help protect and guard against environmental stressors. HOW CAN MEN AVOID FLAKY SKIN IN YOUR BEARD? Dry, flaky skin can ruin the look of a well-groomed beard. Massage Conditioning Beard Oil into the beard area and skin below the beard to help prevent flakes and to minimize dryness and itching. Expert tip: Apply Conditioning Beard Oil with clean hands, because any residue from hair-grooming products left on your hands can weigh down the look of your beard. WHAT OTHER BEAUTYCOUNTER PRODUCTS CAN MEN INCORPORATE INTO THEIR DAILY SKIN CARE ROUTINE? Men can incorporate specialty treatments into their Counterman regimen. We recommend the Overnight Resurfacing Peel, No. 3 Balancing Facial Mask, Countersun products, and SOS Acne Spot Treatment. CAN I SELL COUNTERMAN PRODUCTS AND/OR GET A DISCOUNT? Yes, and yes. By becoming a consultant, you can receive 25%-35% commissions on products you sell and also receive a 25% discount on all products. The global male grooming products market reached a value of US$ 57.7 Billion in 2017. The market value is further expected to reach US$ 78.6 Billion by 2023, exhibiting a CAGR of 5.3% during 2017-2023. - according to this Business Wire article. There is no clear leader in the clean grooming space for men…until now. Here’s another article: The Surprising Trend In Beauty? Skincare Sales Growing The Fastest Among Men's Grooming Products by Forbes.com. 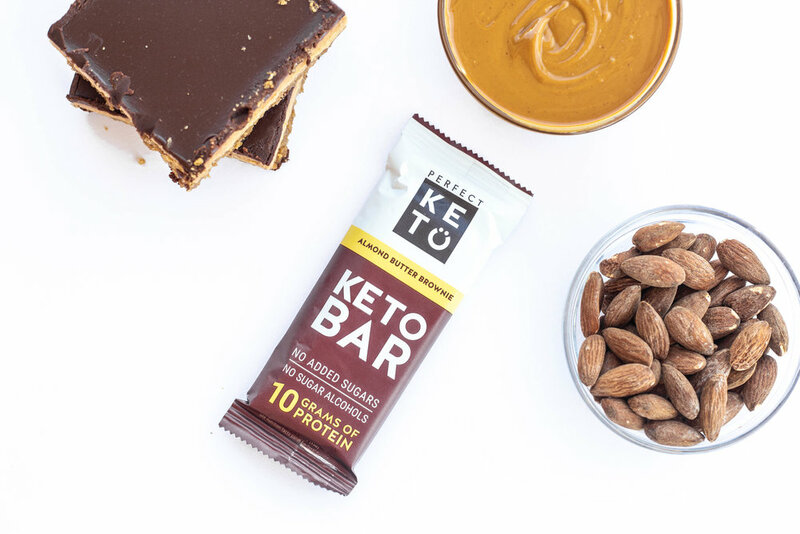 Working for a company at the intersection of the two fastest growing industries - BEAUTY and WELLNESS - is a lucrative place to be. If you have any questions, feel free to reach out to me. SAFER PRODUCTS ARE IMPORTANT FOR MEN TOO. WHY? I appreciate you stopping by! As a thank you I’d love to send you a FREE download of my Healthy Recipe eBook! 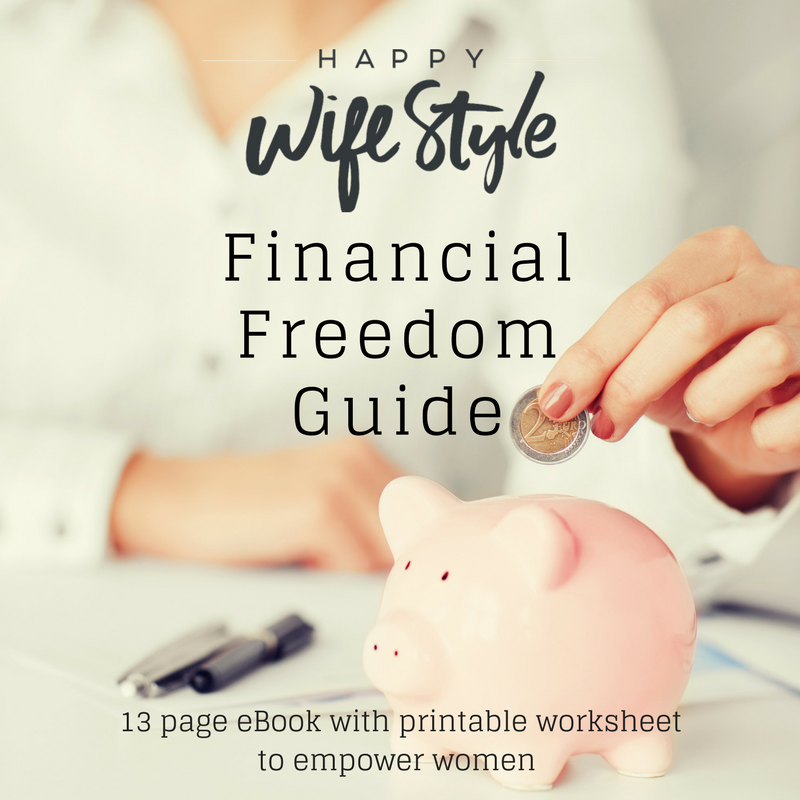 Just sign up here so I know where to send it!